Jan. 10 (Bloomberg) -- Tourist guide Patricia Salazar sees a marvel of nature when she looks at Chile's El Tatio geysers shooting plumes of heated white water vapor high into the air. Italy's Enel SA sees an untapped energy source. Enel and Empresa Nacional del Petroleo, known as Enap, want to convert water heated by magma into electricity. Surrounding towns are lobbying the government to reject the proposal, saying it threatens their revenue from almost 100,000 tourists who visit the geysers annually. The conflict underscores Chile's desperation for energy, said Juan Lindau, a political scientist specializing in Latin America at Colorado College. Neighboring Argentina began slashing natural-gas supplies in 2004, driving up electricity costs 42 percent in the past year and dragging down Chile's economic growth. The venture of Enel, Italy's largest utility, and Chile's state-run Enap is seeking approval for a $20 million project to drill test holes as deep as 2,500 meters (8,200 feet). If temperatures are high enough, they would drill more wells and use the steam to run electric generators, said Carlo Zorzoli, Enel's head of business development for Latin America. 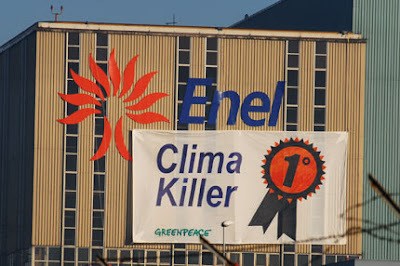 Enel probably would sell carbon credits (See: "The Kyoto Protocol has proved totally ineffective on the practical side", says Italy's Enel / Endesa CEO ) from the project to companies seeking to comply with requirements to reduce emissions of so-called greenhouse gases, said Brian Chase, an analyst at UBS Pactual in Santiago. It might sell them in Europe, where prices are higher than in the U.S., said Manlio Coviello, an analyst at the United Nations' Economic Commission for Latin America and the Caribbean. The power shortage is forcing Chile to choose ``energy (mining) over tourism or energy over the environment,'' Lindau said in a telephone interview from Colorado Springs, Colorado. Chile imports almost three-quarters of its energy. President Michelle Bachelet vowed to develop new power sources and boost alternative energy to 15 percent of new supplies after Argentina's cutbacks. The project could produce about 40 megawatts of power, said Jesus Figueroa, director of the Mining Ministry's geothermal unit. One megawatt is enough to supply about 1,000 U.S. homes. The shortage increases costs for the energy-intensive mining industry, which consumes 30 percent of the country's power. More than a third of the world's mined copper comes from Chile. ``It's a problem of scarcity, prices, necessity and dependence (on foreign mining companies),'' said Patricio Valdivieso, a political scientist at Pontific Catholic University of Chile in Santiago. Enel contends that the geysers won't be affected by drilling. The companies expect to find a heated underground reservoir, separate from the surface water feeding the geysers, Zorzoli said. The wells would be far enough away that tourists wouldn't see them, he said.